If you have upgraded your Dell Venue Pro to Windows 10 and found that you have no audio there is a simple fix; use the Windows 8.1 audio drivers. You do not even have to reboot to get the audio to function. There are more screen shots (in German) and some details of a very similar process HERE. SOLVED: What is Augmented Reality? What is Mixed Reality? What is Virtual Reality? Hi folks. This problem has cropped up on my tablet. I looked at the places above but the files are gone. Appreciate if you can help. It worked for me too, after many failed attempts with other solutions. But as Martin says, you need to update both the Realtek and the Intel sst codecs if your device has both (which mine does). I had the same problem with my Dell Venue 8 Pro and this solution worked for me too after many other failed attempts, but as Martin says, you need to update the Realtek Audio codec as well as the Intel sst one if your device has the same combination (which mine does). 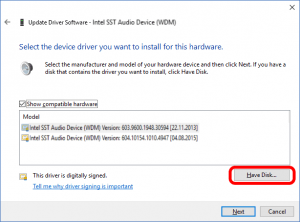 I’ve had this exact problem with my Dell Venue 8 Pro tablet since the Windows 10 Anniversary update and no solution worked, until I discovered that I had to update the Realtek Audio Codec too, not just my Intel SST Audio driver.